The Message. 12 So they went off and preached repentance. 13 They drove out many demons, and they anointed with oil many who were sick and cured them. The New American Bible (NAB) offers a translation that seems minimally functional – merely reporting that they set out on mission and what they did when they got there. A more literal translation of the verse is: “And the went out and proclaimed so that all might repent.” The second part of the verse is a hina clause in Greek, normally indicating purpose, aim, or goal. The purpose in their proclaiming is that people might repent, that is, have a change in mind/heart. Such preaching will include the demands from God and our failure to live up to them. It also includes the grace of God that accepts the law-breakers. It includes the mandate to speak the truth in such a way that it leads people to repent, to have a change in mind about their own sinfulness and about God’s gracefulness. 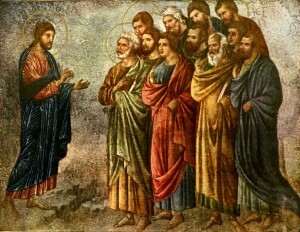 In obedience to their commission the Twelve proclaimed the gospel through their word and deed. Their message and the exercise of power confirm the representative character of their mission. They preach the message of repentance that Jesus had proclaimed; they cast out demons and heal the sick because these activities had characterized his ministry. Their coming to a village brought healing and salvation in the most comprehensive terms because they were his representatives. Jesus had commissioned them and they came in his name. What Jesus did in his own power as commissioned by God, the disciples did in his power. The essential element in the mission is the intrusion of the Kingdom of God “with power.” The expulsion of demons is clearly distinguished from the anointing of the sick, but both actions were visible functions of the Kingdom. They declared that it was God’s intention to apply salvation to man in his wholeness. The focus upon the words and works of Christ anticipates the character of the more permanent mission the disciples received by the appointment of the risen Christ.